Great win for the team yesterday. After a very ugly start to the game, which gave a lot of us a "not again" feeling, the team played very well getting back into the game and building a lead. Looking at the statistical analysis, below is a view of the Four Factors for yesterday's game. It's nice to see Marquette maintain an advantage in almost all areas. Interestingly enough, Marquette did not have an advantage on the Turnover Rate for one of the few times in Big East play. Furthermore, MU managed to get the effective Field Goal Percentage to 50% for the first time since against Notre Dame. The team also managed to keep the opponent from getting to the free throw line. 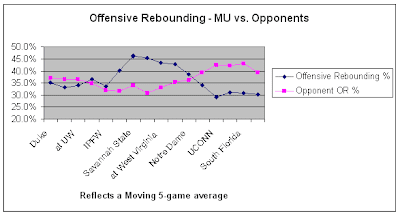 Finally, as has been mentioned Marquette finally managed to out-rebound an opponent, especially on the Offensive end. Despite the fact that Marquette out-rebounded their opponent for the first time in eight games, it still wasn't a very good performance at 31%. At one point this season, we were averaging over 45% at offensive rebounding. Looking at the chart below, we still have a trend where the team is not doing well at either end on the boards. For the individual performances, it does seem a little surprising that McNeal ends up as the statistical stud of the game. A great deal of this has to do with his seven assists and zero turnovers. However, as has already been covered, Ousmane Barro had a great game yesterday. Note that Barro only gets credit (rightly) for 12.7 points produced, because a lot of his success has to also do with the quality of assists he was receiving from the guards. Furthermore, it's nice to see both Hayward and Matthews have net positive games. At this snapshot of the season, Hayward has moved past both McNeal and James to be the statistical MVP of the season. The entire team has 278 net points, which is the sum of all of our win margins. Lazar has contributed 65.7 of those net points, which is greatest on the team. McNeal (60.6 net points) and James (57.7 net points) are not all that far behind, however. 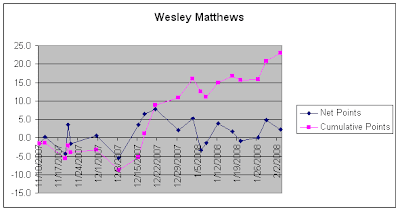 Speaking of Wesley Matthews, it's safe to say that he is now back on track. Looking at the graph of his cumulative point contributions provides a nice way of viewing his progress. For help reading the graph, focus on the cumulative point contributions and whether or not the slope is upward or downward. Despite a middling-to-rough start to the season, Matthews has gradually been sloping upwards, even when the team has been doing poorly. It's been great to see his contributions the last few games, and let's hope that his early season struggles are behind him. At 23.0 net points for the season, he still has a ways to go to catch up to Lazar, McNeal, and James. Not a lot of rest for the team or the fan base, as Marquette gets ready to face Louisville for the second time this season. We should all expect a much better game this time around. More on previews from the CS team later.